The Great Dane is huge, well muscled and an elegant, regal dog breed. The Great Dane is very affectionate and loves to be around people. Because of its majestic carriage, it is know as the Apollo of Dogs. A Great Dane makes an excellent family pet. The Great Dane originated in Germany. 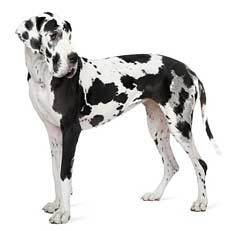 Great Danes range from 30 inches to 32 inches. Great Danes range from 100 to 120 pounds. Great Danes are typically black, fawn, brindle, blue or harlequin. Great Danes have short and flat coats. Their coat only requires occasional brushing. The Great Dane is a gentle and lively dog breed. The Great Dane typically does well with children and other household pets, but supervision is recommended. Often difficult to train, the Great Dane requires a strong leader and firm training. The Great Dane is considered to be a steady dog breed. 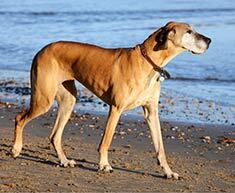 The Great Dane is susceptible to gastric torsion, hip dysplasia, heart disease and tail injuries. The expected life span of the Great Dane is 6-8 years. Great Danes are relatively inactive indoors and tend to be very active outdoors. A house with a large fenced yard is essential for this dog breed. The Great Dane is in the Working group. Also known as the Apollo, Danish Gallant, Deutsche Dogge, Boarhound, Grand Danois or German Mastiff, the Great Dane is a beautiful dog, one of the world’s tallest breeds. If you’re a fan of Marmaduke or Scooby Doo, you’ve already seen one of these gentle giants, but following these cartoon dogs does not begin to compare to seeing the dog in person. Many people think they are seeing a pony when they first see a Great Dane. In fact, some breeds of pony are actually smaller than Danes! As young as four months, a Great Dane will stand 2 feet tall at the withers (shoulders). By nine months they pass three feet, and a full grown Great Dane may stand three-and-a-half feet tall with all four paws on the ground, but a stunning seven feet when on their hind feet. Adult males generally weigh in at 130 to 175 pounds, while females tip the scales at 110 to 150 pounds. They come from Denmark, right? Wrong! Great Danes actually originated in Germany, and have no relationship to Denmark at all. In many countries, the breed is referred to as a German Mastiff, and it is thought that the English and later the Americans used a different name for only historically political reasons. The breed was thought to have been developed as a cross between the Mastiff and the Greyound, while hunters were looking for a large fast breed that could be used to hunt wild boar. Great Danes can come in a variety of colors, but only six are recognized by the American Kennel Club: fawn, blue, black, brindle, harlequin, or mantle. Fawn Danes are yellow gold with a distinctive black mask around the eyes. Blue and black dogs should be a solid color throughout, with no white markings. The blue is a steely color, while the black is glossy. Brindle coloring is a fawn base with black stripes similar to a tiger-stripe pattern, while harlequin dogs have a white base with irregular black patches distributed over the body. Mantle coloring is similar to that seen in Boston Terriers, looking as if the dog is wearing a tuxedo. In these dogs, a white base is covered with a black “blanket” over his back and skull. Other color Danes may be acceptable as pedigreed dogs, but cannot be shown in conformation trials. If you are looking for a show dog, don’t be fooled by a breeder who tries to charge you more for “rare” colors. These colors would include white, fawnequin, merle, merlequin, and fawn mantle. Merle dogs have a solid color base of red, brown, or black, with lighter gray/blue or reddish patches in a mottled pattern. Fawnequins are dogs with a harlequin pattern but the fawn color replaces the white in traditional harlequin dogs. 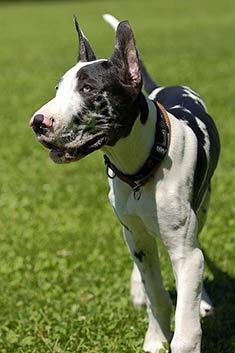 Similarly, merlequin dogs have a merle pattern where the black spots should be. The breeding of white and merle dogs is to be discouraged because the resulting dogs are often deaf. Obviously, the most distinctive feature of a Great Dane is his size. This is definitely a dog for whom counter surfing is a cherished pastime. His strong tail would make a good weed whacker and is at the right height to clear your coffee table. As far as the ratio between height and length, a Great Dane should be basically square, with the dog’s torso measuring as long as it is tall. The ears are floppy and triangular, although they are often cropped in the United States. Historically, ear cropping was done to prevent injury to the dog’s ears when he or she was hunting wild boar. There is no real reason to crop a companion dog’s ears, and the practice has been discontinued in many European countries. What do I get in such a big package? A watch dog? In a word, no. In spite of their large size, Great Danes are very gentle and friendly. They love other animals, children, your Aunt Marge, and even the guy who intends to rob you blind. They rarely bark. A dog who needs lots of exercise? Not so much. These dogs will enjoy a daily walk or a romp in a fenced-in yard, but too much exercise, particularly when the dog is growing, can put the dog at risk for bone and joint problems. As an adult, dragging around his or her massive frame will cause your Dane to tire more easily than some smaller breeds. Common fence heights of four feet will not be sufficient for a Great Dane. Install a minimum six-foot fence to keep your Dane safe at home. Great Danes have been known to get their exercise by competing in dog sports such as agility, lure coursing, and flyball. A good family companion? Most definitely. These dogs are easy to train and can adapt to any size of living space. Most people assume that large dogs need large homes, but in the case of a Great Dane, he is just as happy to lie around once he graduates puppyhood. He doesn’t need room to romp as many other large breeds do, and he will happily join you on the couch for an evening of television. A money pit? As with any large dog, you need to be prepared for huge food bills. And any old food won’t do. Premium food should be given to Great Danes, particularly while they are growing. In addition, Great Danes have many genetic health issues to which they are susceptible, making for a larger-than-average vet bills. Crates, collars, toys, shampoos, and all other accessories need to be bought in XXL sizes, which are more expensive than those for smaller dogs. Great Danes are susceptible to several health problems, primarily by virtue of their giant size. For example, bloat, also known as Gastric Dilation and Volvulus (GDV), is the number one killer of Great Danes. In this disease, the dog’s stomach distends and rotates, which cuts off the blood supply and shuts down the digestive tract. The dog’s abdomen will appear enlarged and he or she may retch repeatedly when GDV is developing. Without immediate veterinary assistance, a painful death follows in just a few hours. To prevent bloat, Great Danes are generally fed multiple small meals per day and restricted from vigorous activity around meal times. Raised food and water dishes may also provide some protection. Some Dane guardians ask their vets to perform a preventive surgery which tacks the stomach in place to prevent it from twisting. If you are considering living with a Great Dane, consult your vet about this procedure known as gastropexy. This is sometimes done when the dog must be put under anesthesia for spaying or neutering. Hip dysplasia is a concern in Danes, as it is in many large breeds. This inherited disease results in malformation of the hip joints with symptoms ranging from mild aesthetic irregularities to outright crippling. Before breeding, the parents should be X-rayed and certified as free from hip malformation by either the Orthopedic Foundation for Animals (OFA) or the University of Pennsylvania Hip Improvement Program (PennHIP). Never, ever buy a large breed puppy without seeing one of these certifications from the breeder for both parents. Cervical vertebral instability (CVI) will make your dog appear to be drunk. Pressure on the spinal cord in the neck means the dog will walk with his head down and will stumble or walk uncertainly. Also known as “wobblers”, CVI is thought to be the result of inheritance and poor diet. 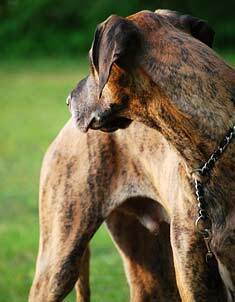 In addition, with their long necks, Great Danes may acquire CVI if they have some trauma to the neck. As a result of CVI, Danes may be susceptible to orthopedic injuries due to their clumsy gait. Hypertrophic Osteodystrophy (HOD) is a painful condition that attacks rapidly growing bones and can cause lameness and even death. Usually occurring between the ages of two and eight months, HOD disturbs the blood flow to the dog’s growth plates, leading to small fractures in the weakened bone. In severe HOD, the dog’s pain leads to loss of appetite, depression, and dehydration which may lead to death if severe. Great Danes may also experience cardiomyopathy, hypothyroidism, and cancer, primarily of the bone and lymph system. An average Dane lives 8 – 10 years, but this lifespan can be increased to 12 – 14 years with high quality food and careful breeding. Is the Great Dane the right dog for me? If you are looking for a gentle giant who is easy to train and will be a great companion to all members of your family, the Great Dane may be just perfect for you. However, if you will struggle financially to meet his nutritional and medical needs, you may want to look for a smaller breed. Find Great Dane Puppies with our Free Breeder search!